With the arrival of winter come new seasonal health issues. Frostbite, colds, flu, sore throats, dry skin, asthma, and cold sores are some of the more obvious seasonal maladies, but there are others that may be flying under your radar. Here, we will consider five less familiar cold weather health issues for you to keep in mind this winter, whether you’re staying indoors or venturing out into the cold. The risk of heart attacks climbs exponentially during the cold weather months – a 53 percent increase over the summer months. This could be due in part to the number of people who have to shovel snow to clear sidewalks and driveways in the North, but the increase is consistent across warmer climates where there isn’t much frozen precipitation. Arteries constrict in response to cold, cutting down blood flow and forcing your heart to work harder. The American Heart Association notes that people who suffer from heart disease also tend to see an increase in the chest pain and discomfort of angina during the winter. All in all, your heart has to work much harder to keep your body heat up when it’s colder. Winter isn’t known for sunny days – in some parts of the country the sun may not make an appearance for months at a time. Vitamin D is absorbed through the skin, and sunlight is its primary source. 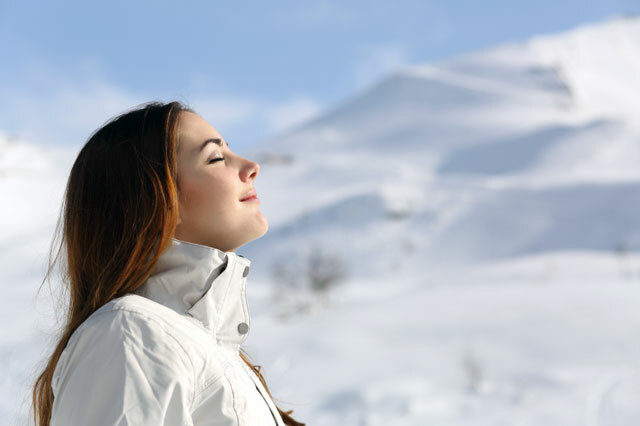 This means that you are more likely to have a vitamin D deficiency during the gray winter months. If you have lower levels of the sunshine vitamin, you are at higher risk of experiencing a heart attack or developing heart disease, osteoporosis, Parkinson’s disease, and dementia. More than one study has indicated that if you have decreased levels of vitamin D you’re two times as likely to suffer stroke or heart attack as someone with higher levels. If you can’t find a way to get 15 minutes of sun daily, you may want to talk to your doctor about increasing your vitamin D level with supplements. You may know them as the winter blues, but another issue related to the weather and sunshine is Seasonal Affective Disorder, appropriately called SAD. Up to one in five Americans experience the onset of depressive symptoms associated with SAD during the fall and winter months which may include sadness, anxiety, hopelessness, irritability, fatigue, guilt, a lack of energy, and thoughts of suicide. Not everyone affected by SAD has the same symptoms, and there are variations in the number of people who experience the condition depending on geographic location. The causes of SAD are still unknown, but some experts link the condition to an imbalance in serotonin and melatonin, the chemicals in the brain that regulate sleep, mood, and energy levels. Fortunately for those suffering from SAD, increased exposure to artificial light seems to alleviate some of the symptoms. The disorder also tends to subside as the sunnier summer months approach. As the temperature drops and the thermostat rises, heating costs skyrocket. Many of us try to offset this by lighting a fire in the fireplace, firing up wood and gas stoves, or plugging in kerosene or electric heaters. These heating methods have the potential to produce carbon monoxide, a deadly, invisible odorless gas. Over 400 Americans die annually from unintentional carbon monoxide poisoning. For fireplace users, have your chimney and flue inspected annually and cleaned as necessary. If you haven’t already, install smoke and carbon monoxide detectors. Be cautious when using space heaters, keeping them at least three feet away from anything flammable. Kerosene stove users should crack a window open to be on the safe side, and never use a gas stove, charcoal grill, or any other device that wasn’t designed specifically for indoor home heating. Finally, keep and maintain a functioning fire extinguisher that can be used to put out a variety of different types of fires. When you are out in the cold for long periods of time, your body temperature can to drop to dangerously low levels. If it dips below 95 degrees, you may experience hypothermia, which can affect your ability to move or to think clearly. Older adults are more susceptible to hypothermia because they tend to produce less body heat than younger people (the same is true for infants). People who consume alcohol outdoors may also have difficulty discerning when the temperature becomes too low. As the effects of hypothermia kick in, you may feel disoriented, tired, and confused, leading to uncontrollable shivering. The best way to recover during these milder early stages is to warm up again using blankets. If untreated, people experiencing hypothermia eventually stop shivering or feeling cold, developing dilated pupils and blue skin and, finally, losing consciousness. In these late stages, direct medical treatment involving warm fluids administered intravenously, blankets, and warming lights is required. Staying safe and warm during the long, cold winter months doesn’t have to be difficult, especially not when you have your local FastMed Urgent Care facility to help. Play it safe and keep our number handy – you’ll be glad you did!